We are writing to reaffirm our commitment to the unbreakable bond that exists between our country and the State of Israel and to express to you our deep concern over recent tension. In every important relationship, there will be occasional misunderstandings and conflicts. The announcement during Vice President Biden’s visit was, as Israel’s Prime Minister said in an apology to the United States, “a regrettable incident that was done in all innocence and was hurtful, and which certainly should not have occurred.” We are reassured that Prime Minister Netanyahu’s commitment to put in place new procedures will ensure that such surprises, however unintended, will not recur. The United States and Israel are close allies whose people share a deep and abiding friendship based on a shared commitment to core values including democracy, human rights and freedom of the press and religion. Our two countries are partners in the fight against terrorism and share an important strategic relationship. A strong Israel is an asset to the national security of the United States and brings stability to the Middle East. We are concerned that the highly publicized tensions in the relationship will not advance the interests the U.S. and Israel share. Above all, we must remain focused on the threat posed by the Iranian nuclear weapons program to Middle East peace and stability. From the moment of Israel’s creation, successive U.S. administrations have appreciated the special bond between the U.S. and Israel. For decades, strong, bipartisan Congressional support for Israel, including security assistance and other important measures, have been eloquent testimony to our commitment to Israel’s security, which remains unswerving. It is the very strength of this relationship that has, in fact, made Arab-Israeli peace agreements possible, both because it convinced those who sought Israel’s destruction to abandon any such hope and because it gave successive Israeli governments the confidence to take calculated risks for peace. In its declaration of independence 62 years ago, Israel declared: “We extend our hand to all neighboring states and their peoples in an offer of peace and good neighborliness, and appeal to them to establish bonds of cooperation and mutual help with the sovereign Jewish people settled in its own land.” In the decades since, despite constantly having to defend itself from attack, Israel has repeatedly made good on that pledge by offering to undertake painful risks to reach peace with its neighbors. We recognize that, despite the extraordinary closeness between our country and Israel, there will be differences over issues both large and small. Our view is that such differences are best resolved quietly, in trust and confidence, as befits longstanding strategic allies. We hope and expect that, with mutual effort and good faith, the United States and Israel will move beyond this disruption quickly, to the lasting benefit of both nations. We believe, as President Obama said, that “Israel’s security is paramount” in our Middle East policy and that “it is in U.S. national security interests to assure that Israel’s security as an independent Jewish state is maintained.” In that spirit, we look forward to working with you to achieve the common objectives of the U.S. and Israel, especially regional security and peace. Three Palestinian children have been wounded after Israeli planes and helicopters launched a string of air attacks on the Gaza Strip overnight. The Israelis claimed that the air raids were in response to rocket fire from Gaza, but Hamas which runs the Palestinian enclave blamed the Israelis for the escalating tensions. According to Palestinian medical sources, at least seven missiles targeted various Gaza sites. 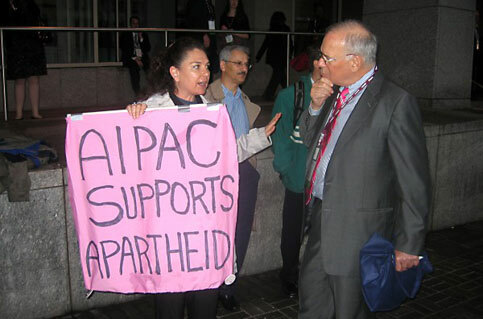 Activists protesting outside the AIPAC policy conference carried signs highlighting Israel's rights violations. Activists protesting outside the AIPAC policy conference carried signs highlighting Israel’s rights violations. The theme of this year’s annual policy conference for the American Israel Public Affairs Committee (AIPAC) lobby group was “Israel: Tell the Story.” And it was quite a story that AIPAC wanted to tell. The conference aimed at imparting to the more than 7,000 attendees “an intimate understanding of the many ways that Israel is making the world a better place,” with a focus on peacemaking and innovation. Official statement released by the JQ on 30 March 2010 re the Wigmore protest. Please compare their announcement with the evidence provided by Vanesa Fuertes [see at the bottom of this email]. The announcement claims they are “not politicians”, yet it reads as if written by an Israeli official. While they claim “We are musicians, not politicians”, they try to score political points because “two of us are regular members of Daniel Barenboim’s West-Eastern Divan Orchestra, composed of Israeli and Arab musicians”. In concert with Israeli propaganda they portray the image of Israel free of Apartheid, in which all is needed is for “Israeli and Arab” to be seen together. They don’t even utter the identity of these Arabs, recognised by others as Palestinians. In compliance with Israeli propaganda, their entire announcement not once mentions Gaza or the Siege, the ethnic cleansing of Jerusalem, etc etc. The people they recognise to endure any sufferings are “the audience in the Hall, the staff of the Hall, and the radio audience wishing to hear the concert”, who were victims of the “upsetting” “acts of the demonstrators inside the Hall”. Of course they did not omit another group of victims: themselves, for suffering from being “subject of demonstrations of the kind” at Wigmore Hall. According to the JQ even Israeli soldiers are just “fellow citizens” for whom they played during their military service. The JQ had not a single word of criticism of Israel, not a single criticism of it policies and actions against Palestinians, not a word of compassion for children in Gaza who have no chance of developing their musical experience under siege which deprive them of food and clean water and even pen and paper. On the other hand, the JQ don’t hesitate to criticise “The demonstrators” for being “mistaken and ignorant and inconsiderate”. Now that the JQ made clear its position, there should be little doubt it is a legitimate target for boycott. That is until it would genuinely change. Our lunchtime concert at the Wigmore Hall yesterday, 29 March 201, was repeatedly interrupted by protesters seeking to demonstrate against the Government of Israel. The acts of the demonstrators inside the Hall were upsetting to the audience in the Hall, the staff of the Hall, and the radio audience wishing to hear the concert on Radio Three. The demonstrators were mistaken and ignorant and inconsiderate. The demonstrators were mistaken because we are not representatives of the Government of Israel. We are Israeli citizens, but have no connection with or patronage by the Government. We no more represent the Government of Israel than the audience at the Wigmore Hall represented the Government of the United Kingdom. As Israeli citizens, we were required to, and did, perform our National Service when we were aged 18. As it happens, none of us was in a combat unit. We served our conscription as musicians playing for our fellow citizens. To identify our conscription, particularly since it was so long ago, with support for government policies is as irrational as blaming members of the Territorial Army in this country for the invasion of Iraq. The demonstrators were ignorant of the fact that two of us are regular members of Daniel Barenboim’s West-Eastern Divan Orchestra, composed of Israeli and Arab musicians. We teach and lead our respective sections of that orchestra. It is destructive of our attempts to foster Israel-Arab relations for us to be the subject of demonstrations of the kind we suffered yesterday. · are seen by Palestinians as a legitimate target for the cultural boycott on the basis of accurate information. “the quartet was founded within the framework of the Young Musicians’ Group of the Jerusalem Music Centre and the America-Israel Cultural Foundation [AICF] in co-operation with the Conservatory of the Jerusalem Rubin Academy of Music and Dance”. 1.1) The Jerusalem Music Centre (JMC), which worked to get the Jerusalem Quartet into the Israeli Army, was established by the mainstream Zionist organisation, the Jerusalem Foundation, which PACBI refers to in their support for a boycott of the Jerusalem Quartet. 1.2) The JMC is located is an illegal settlement in the Occupied West Bank, illegal under international law. From AICF homepage: “Unfortunately, the bulk of AICF’s endowments were invested with Bernard L. Madoff Securities”. 2) This article explains about their start as a quartet, the support given by the Jerusalem Music Centre (JMC), and the link to the military describing their status as “status to Distinguished IDF Musicians and continue to play for troops three times a week when they’re in Israel”. 2.1) in this article it mentions how the JMC is located in the Mishkenot Sha’ananim, where the JQ has been allocated to built studios there to practice and what they call home. 4) In 2006 in an article they were quoted as saying ”People say we are the best ambassadors from Israel, and we are happy about that,” cellist Kyril Zlotnikov said in Melbourne yesterday. The Jerusalem Quartet are sponsored on their tour of Australia and NZ by the Israeli Embassy in Canberra, according to the Canberra Times of May 5, 2004. 1) Jerusalem Quartet concerts from the Library of Congress (across from the U.S. Capitol) in April saw the Israeli Ambassador introducing the JQ.